Grandpa With Alzheimers, Parkinsons & Dementia Dances to “Tale as Old as Time” With 3-Yr-Old GranddaughterAnd It Is Absolutely Heart-melting! Beauty and the Beast ‘ s trademark song “Tale as Old as Time” is sappy sufficient to get the waterworks moving — but add an adorable 3-year-old in a light-up dress and a sweet granddad being held up by his grown son, and Hole. Lee. Cow. You best bust out the Kleenex supply. 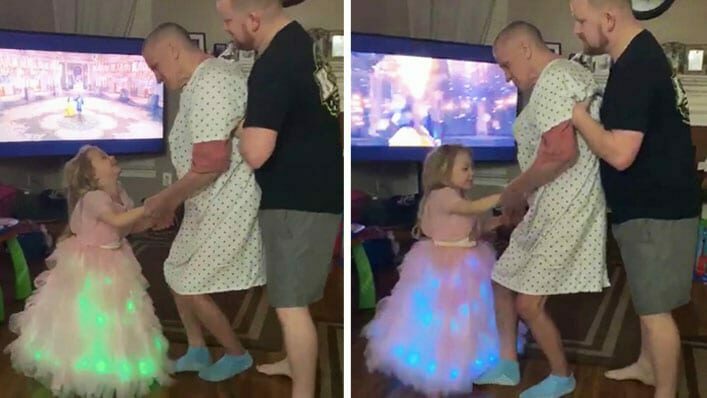 Dean Evans’ daughter urgently wanted to go to a ball to dance with her granddad, so[ as] 3-year-old’s do, she put on her dazzling Disney dress and had an improv projectile of her own right in the middle of her living room. The heart-melting Facebook live video is swiftly exiting viral, and only 10 seconds in, it’s not hard to see why. Check it out below! My daughter wanted to dance with my dad. She required him to go to a ball with her so she grabbed her Disney dress. Melts my heart. My daddy has Alzheimer’s and Dementia and Parkinson’s only 66 years old. She is 3.